An over-sized binder and storage pages keep your CD's organized and clean with this ring binder and storage page kit. Convenient 2 inch D-Ring ring binder with spine index label holder. Binder holds 80 CDs in strong, safe, polypropylene pages and is expandable to 144 CDs with optional refill pages. 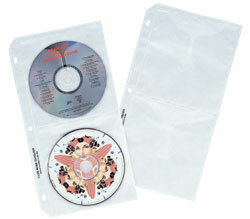 Insert pages feature a non-woven material that cleans the CD each time you place it in the holder.